If you asked me to encapsulate my impressions after seeing Philip Glass’s latest opera I would say CHARMING. It may sound like a horribly twee response to a new work but it is exactly what I was thinking during most of it. The work is not scruff of the neck exciting or particularly fast paced. But the way it unfolds Walt Disney’s last months of his life is an intriguing work that Phelim McDermott treats with respect and assisted by Improbable’s skilled artistes and Dan Potra give a rich visual manifestation. The mood of the piece is rather sepulchral as it opens with the terminally ill Disney sleeping and having a nightmare about an owl he saw as a child. Surrounded by animated (the Improbable crew springing out of them) drawing portfolios that get raised to the ceiling and eventually unfold to become screens for the projections creating a sense of enclosure. The set adopts shorthand references to his studio life, two cinematography cranes tower above with two cameras. The aesthetic is undeniably industrial conveying a sense of Mad Men sleekness with great use of animated drawings as backdrops bringing the story to life. His bed is on an animator’s drawing board, the bed given the prominence one would expect from a work that deals with the threat of imminent death. Glass’s music is dominated by five or six melodic ideas that recur and are woven in a rich textual tapestry adorned with prominent parts for cello and flute. It sounds like Glass and it works its insidious magic like most of his music. It takes over one’s thoughts and is deeply immersive. Even obvious failings in the unnecessary showy, wordy and at times crass libretto (one phrase comes to mind ‘I’m like a bee collecting pollen from desk to desk‘ on illustrating his studio working practise) by Rudy Wurlitzer are not making too much of a negative impact as the cast and director are giving the material flight. Using animated drawings to tell Disney’s story is an obvious way to make it happen. The sheer beauty of the projections by 59 Productions and their integration with the set design is astounding. 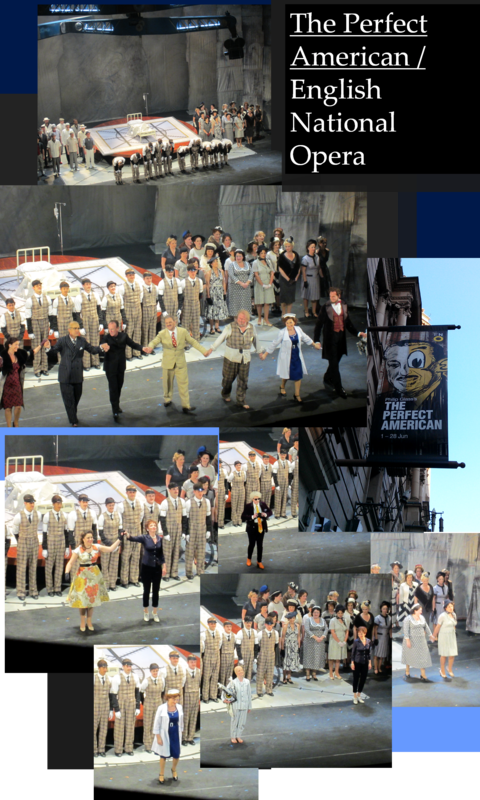 Unlike many opera productions they do not feel like an unnecessary add-on that all too frequently annoys. Here it creates his hometown in a double projection on the cloth suspended from the crane above and a back projection that harmonise to give wonderful depth while the chorus praises the generic looking “midtown USA” nature of Marceline, the silly apple pie references in the libretto is forgettable but the setting adds considerable magic to some evocative choral writing. The staging is inferring the very nature of Peter Stephan Jungk’s book which could be called a fable biography. A composited life story that relates to Disney’s life but instead of taking a realistic root it uses the absurd as a device to explore concerns that a straight biography couldn’t. In that context an animatronic Abe Lincoln and a fan visit by Andy Warhol are becoming an expose of controversial aspects of his character (totalitarianism, dubious racial beliefs, political conservatism) and a mirror of how other artists saw his work is revealing. Those two encounters are a welcome break from the linearity of the narrative and provide some welcome light relief. Overall the staging successfully fuses aspects of biographical detail with coup de théâtre moments of physical theatre. Like when the family are travelling back to LA from Missouri the projection on the semi transparent cloth is of a miniature railway (like the one in Disney’s garden in LA) overlayed with the performers behind it. An imaginative depiction of the journey sequence but also a time for the silly antics of adults riding a miniature railway. Equally the way Marceline’s high street, Kansas Avenue is treated visually as a template for the Main Street in Disney resorts the world over. The inextricable fusion of reality and fantasy is a fundamental aspect of Disney’s output and one of the main reasons for his cultural omnipresence. This production manages to allude to so much while using subtle but beautifully realised metaphors. Near the end his diagnosis of advancing cancer is made by a doctor standing in front of a screen projecting a chest x ray with as his description of the seriousness progresses we see the tumours grow and multiply, suggesting in shape Mickey’s head, as used by the company in many forms of merchandising and branding. His lungs been literally taking over by a drawing Mickey Mouse is a good way to describe the overall effect of the animation. Disney’s boss like the thousands of staff he employed was taken over and consumed by this cannibalistic corporation. The animations are directly linked to the narration but make much bigger suggestions of underlying motives and his complex psyche.As such what Improbable have done is remarkable and deliciously vibrant. 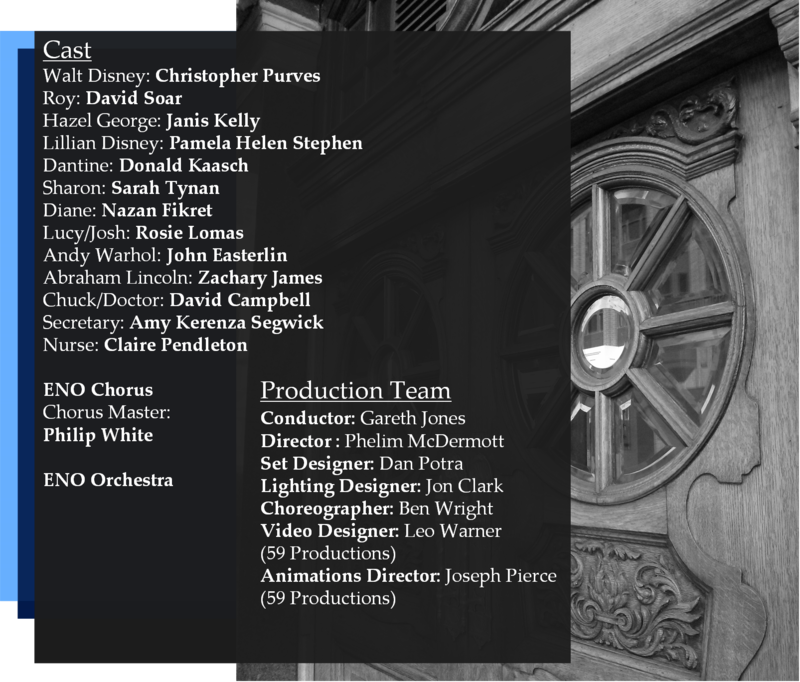 The many references to stop frame animation and the overall filmic character is something I imagine it would enthrall most people in the audience admiring the sleek presentation and how it gently fuses text, visuals and music. The singing by the cast was excellent. Most of the writing is heavy in recitativi with the more lyrical passages adding variety. The writing for the chorus is a very strong component that adds urgency and a quasi-Disneyland celebratory mood, one is never able to discern where the servile cheering stops and the irony starts. Christopher Purves gives a bravura performance, reprising his role from Madrid’s world première showing. He is authoritative and can dominate the stage for the duration despite being the unflinching focus of the work. Tellingly the most tender and most horrid parts are when he is faced with children. His interactions with the adults are based on rank and dominance but he is either terrified of the children (like Lucy that shows up on the night of his birthday party and puzzlingly for him she doesn’t have any knowledge of his work) or comes to terms with mortality when he meets a child cancer patient called Josh (performed like Lucy by Rosie Lomas) in a series of tender exchanges the world of his creations blends into the reality of a fading patient in hospital. The character of Dantine is a little too knowing and mugging for its own good but Donald Kaasch puts in a polished performance that brings to life what is the least subtle character in this opera. The ladies of the Disney clan and Janis Kelly as his personal nurse and confidante are wonderfully camp and mere suggestions of real characters but they add to the dream-like atmosphere that make this work what it is, a meditation on an enigma. This opera does what a fair few have failed, it is filled with ideas that are expressed with simplicity and clarity. The sense of a journey through the story is eloquent and told with sensational gusto. The PR waffle of a great american composer taking on an american legend maybe a too simplistic an observation but there is a sense of purpose and it definitely is a work that feels mature and quietly thrilling. Go and see it if you are in London over the next weeks. It is also coming out in September on DVD and Blu-ray by Opus Arte (they STILL don’t have a functioning website) from its Teatro Real outing, I would urge anyone with an interest in Glass’s work to give it a try, hoping that the staging will translate equally well in a recording.